Practice "Love Cooking" - during the preparation of food for our family and friends, we think of our love for them, and put this energy into the food. We want cleanliness at all times, but not sterility. Sterility is the enemy of wild fermentation. Chemical free food, chemical free salt, chemical free water, and chemical free washing products - otherwise we kill that which we wish to promote. 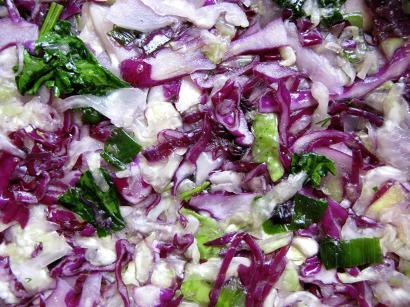 Finely shred a large, organic green cabbage, and mix with any additional ingredients in a large bowl. Have a bowl of good quality salt to hand, and find your fermenting vessel. 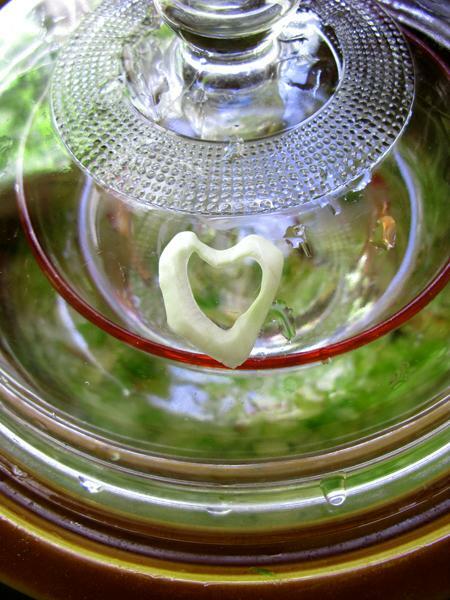 Glazed ceramic or glass are the only things I like to use, but many people ferment in plastic. Whatever it is, it will need a lid, and you will need a plate or bowl or dish that fits snuggly inside it (more or less). A good ratio to ensure perfect fermentation is one good tsp of salt for every 500 g of shredded cabbage (or 1 scant tsp per lb). Either place all your ingredients in a large bowl and massage well until liquid is expressed from the cabbage, or salt as you load the crock. To salt as you go, take a layer of your mix, add to the vessel, then add a pinch of salt. Push it down into the crock with your fist - hard! We want to bruise the cabbage, because we need the salt to draw us much water of it as possible. Add another layer, another pinch of salt, then press down hard with your fist. Repeat until all the cabbage is in. 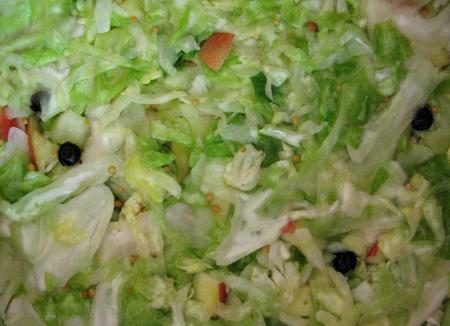 By the time you have finished, the salt should have drawn enough liquid out of the cabbage to cover it. If not, add brine at 1 tsp per cup of water to cover. 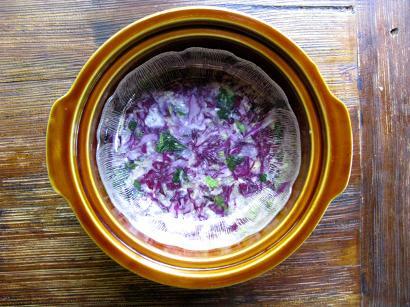 Put your plate or whatever in to keep the cabbage below the brine. Weight it down if necessary, with a scrubbed and boiled river stone, a stone pestle, a glass paperweight, a jar of water, anything that is stone, glass, or ceramic. 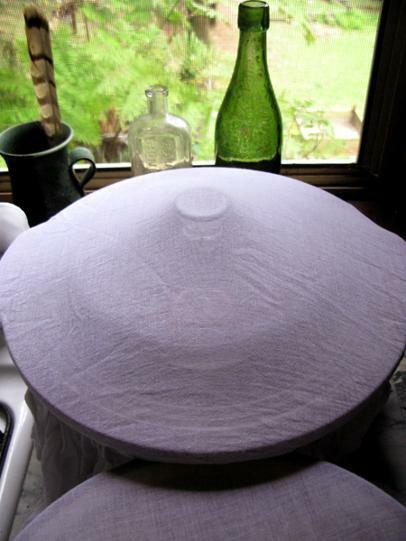 Put the lid on, and cover with a clean tea towel or muslin cloth. Check every day. With clean hands, remove the plate, and rotate the cabbage. Especially any that has floated to the surface. We want anaerobic fermentation (without air)! After a a few days to a week, taste, then taste more regularly and put in jars when the taste is to your liking. As the process proceeds, the brine slowly becomes acidic, like a vinegar. The more acidic it gets, the more varied and numerous the strains of beneficial bacteria. You can also leave it fermenting, and just eat it out of the crock, enjoying the ever-changing taste. 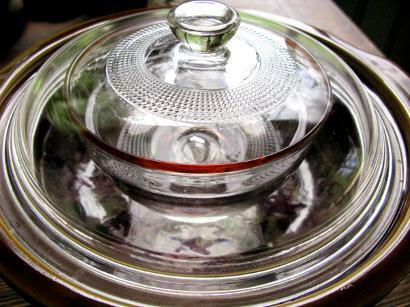 If jarred, refrigerate (to stop fermentation), then bring to room temperature before eating. In warm, humid conditions, mould may be a problem. If mould is an issue, check everyday and remove any blooms from the surface of the brine, the sides of the crock, the weight, and the lid. You can also buy purpose built crocks with a rim of water that limits air. But remember – micro organisms come from the air, as well as the surface of the vegetables and from us. All ingredients should be organic or chemical free, and the water must contain no chlorine. 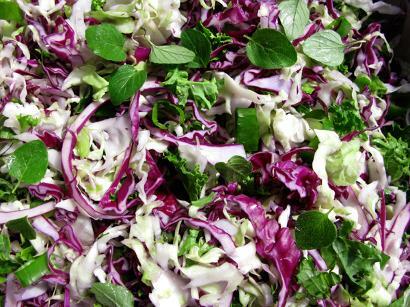 Finely chop or shred the cabbage. The thinner the cabbage, the sweeter the sauerkraut! Cut the shallots into thin rounds, including the greenery. Tear the kale off the central stem, and into small pieces. Finely dice the garlic, finely slice the dill weed, andleave the oregano leaves whole. Place everything in a big bowl and mix well, the result will look something like the picture above. Grab a big handfull of the mix and place in the crock. Sprinkle some salt over the top and then tamp down hard with your closed fist. The idea is to bruise the vegetable matter so the salt may draw out the moisture. This creates the brine that will eventually cover the vegetables and exclude oxygen so we have anaerobic fermentation. Repeat this step until all the vegetables are in the crock. Once you have finished, it should look something like this (left). The vegetables are bruised and compacted well. When a little pressure is put on them, the brine should rise up, so when we place our weight on top, all the vegetable matter will be submerged. To find the best way of weighing down your vegetables will require a little ingenuity. In this crock, I have found a glass serving dish that fits fairly snuglgy (left). For this amount of vegetables, I can just fit a red-rimmed glass bowl filled with water and still get the lid on the crock. The vegetables are suffieciently weighted down so that nothing is above the brine. Place the crock in a warm place, out of the way, but somewhere it won't be forgotten. We need to check the crock regularly after the first couple of days. First, give your hands a good wash, uncover the crock, and lift out the weights. Check all vegetable matter has remained submerged, rotate them a little, then tamp down again. Give the weights and lid a good rinse, then replace. If any mould is encountered, wipe or skim it off immediately. Wipe surfaces with a cloth damp with brine. Mould is not a drama unless severe, and is dependant on variables of temperature and humidity. Warm and humid means keep a eye out for mould. 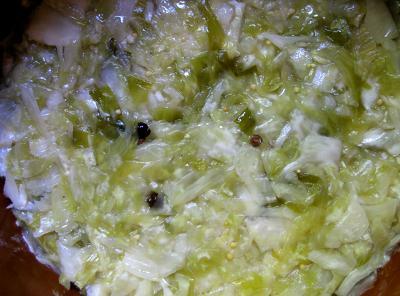 Enjoy your delicous sauerkraut when the salty brine has become a sour and tangy "vinegar". Cover your crock with muslin or similar cloth. I buy a few metres (yards) from the fabric store, wash it, then cut it to size for all my various-sized crocks. Tie string or stretch an elastic band so the cover is tight. This keeps insects, dust, and other airborne solids away.